Today's blog will have a couple of recipes that get a nice beginning from slow-cooking bones, and I'll show you how to make a home protection bottle using bones. We certainly have had the bitter cold this winter, haven't we? The cold has made me want to make all different kinds of soups or chili. I love soup or chili on a cold, winter day. This month's moon has several names: Snow Moon (I think I don't have to say how accurate this name is this year), Hunger Moon, Blackbear Moon, Starvation Moon, and Wind Moon. The name that I am going to go with is Bone Moon. Winter was especially hard for the indigenous peoples. This month their food stores would be getting low before the spring came and they often depended upon bone soup and bone marrow for survival. They were smart in their eating. Bone marrow soup is one of the best things that you can consume. It provides excellent nutrition. 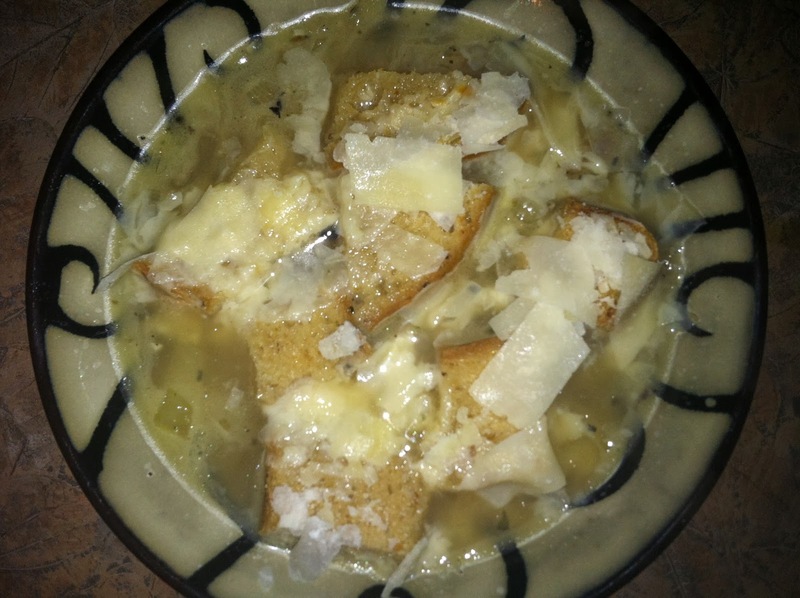 I made some bone marrow broth and the next day I used the broth to make French Onion soup. 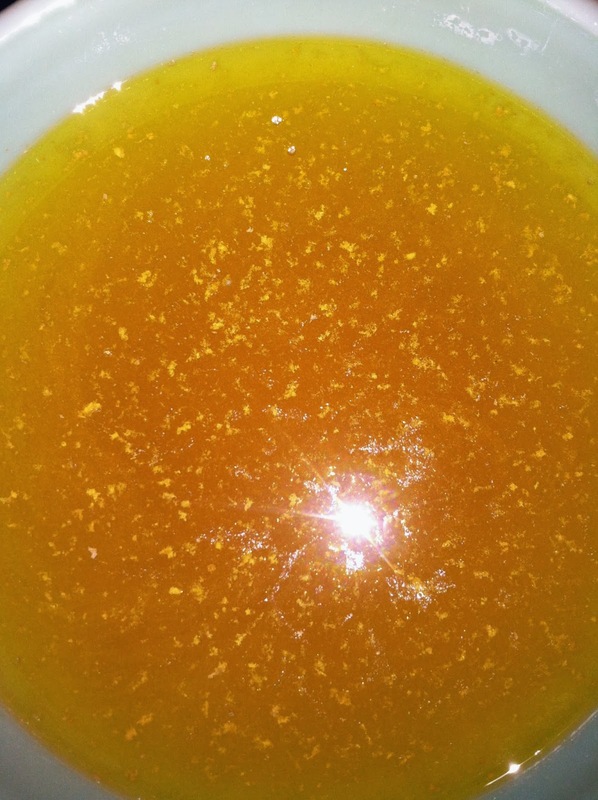 The link to the recipe for Bone Marrow Broth is here: http://nomnompaleo.com/post/3615609338/slow-cooker-beef-bone-broth, I used fresh ground pink Himalayan salt in mine, that was the only difference. My bones are already to be slow cooked! 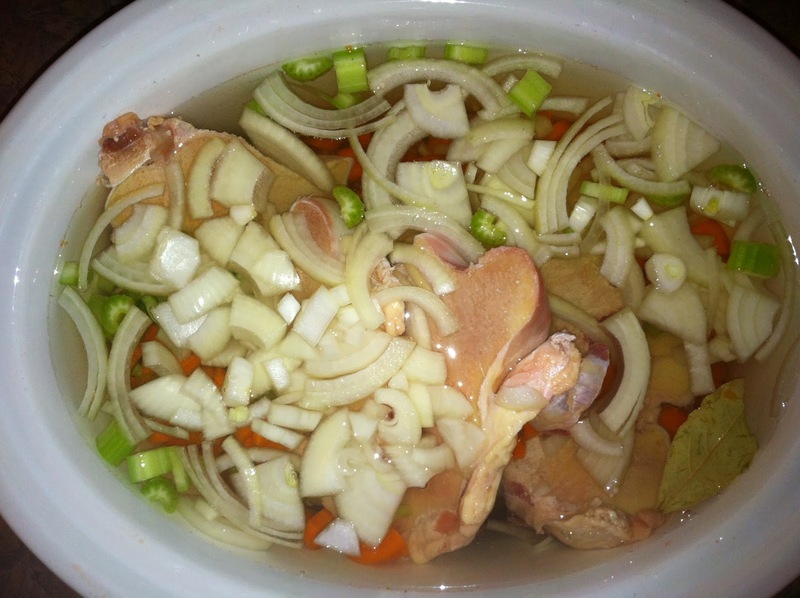 My broth after 8 hours of slow-cooking! Here is the recipe for the French Onion Soup that I used. I can't eat gluten, so the only difference that I did was change the bread. I used Sara Lee gluten free bread. I toasted it with some gruyere cheese, then tore it up and added it to my soup, and threw some fresh parmesan on that. Bones are also a component that it is used frequently in magicks. They have been used divination (osteomancy), shamanistic works, ancestry work, spellcasting, protection, and amulets. 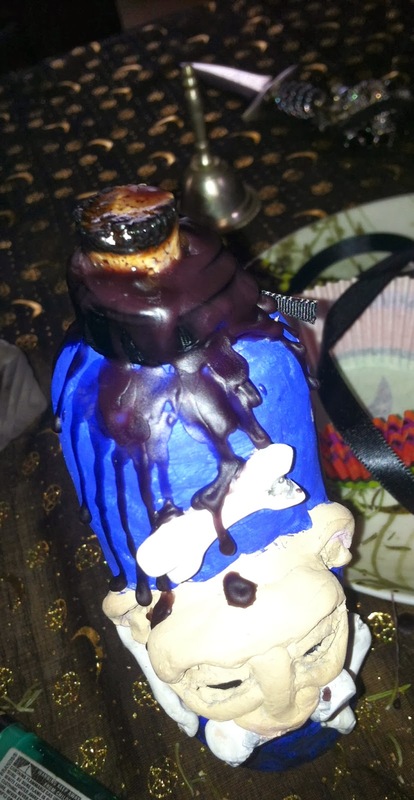 So, today I thought it would be fun to make a Bone Moon Witches Warding Bottle for your home. Witch's bottles are an ancient form of magic. What you do with your bottle after you have it made will be up to you. You can put it in a secret spot in your home, bury under where you hold circle outside, or the furthest corner of the yard, or near your front door. These are common places to put them. I will be using coyote toe bones in my bottle today. There are plenty of sellers on etsy that are bone collectors. They don't kill the animals but they do find the dead animals and clean their bones for crafts and jewelry making. If you are squeamish about acquiring bones this way, then use chicken bones from your dinner, or you can make the bottle without the bones. The reason I chose the coyote was because this will be a home protection bottle and coyotes are very protective of their dens. I'm using a toe bone because it is small and will fit inside my bottle. You don't want skulls for this project, lol. Other reasons I chose coyote bones, based on totem of the coyote: adaptability, illusion and chaos can be stripped away to reveal truth, and sense of humor in life's lessons. 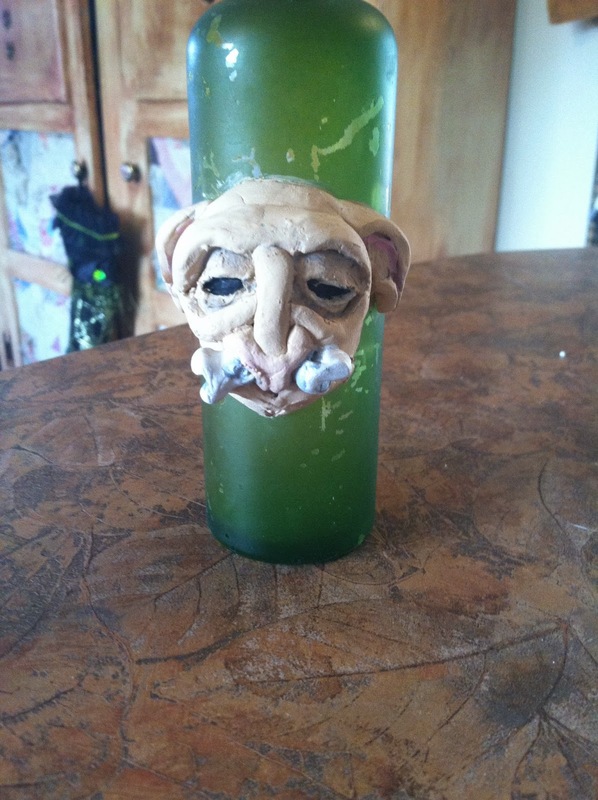 This is the first time that I've made a goblin out of clay. I have been itching to do it on a project, so I made a bone goblin. See the bone going through his nose? Yes, I know. I do get carried away with projects....sometimes. Do NOT add your items to your bottle yet. For a bottle you will want to cast a full circle and make your bottle inside your circle. I'm now going to go over items that are good to add to your bottle. I've made those bold. Gather your items. You want sharp things. 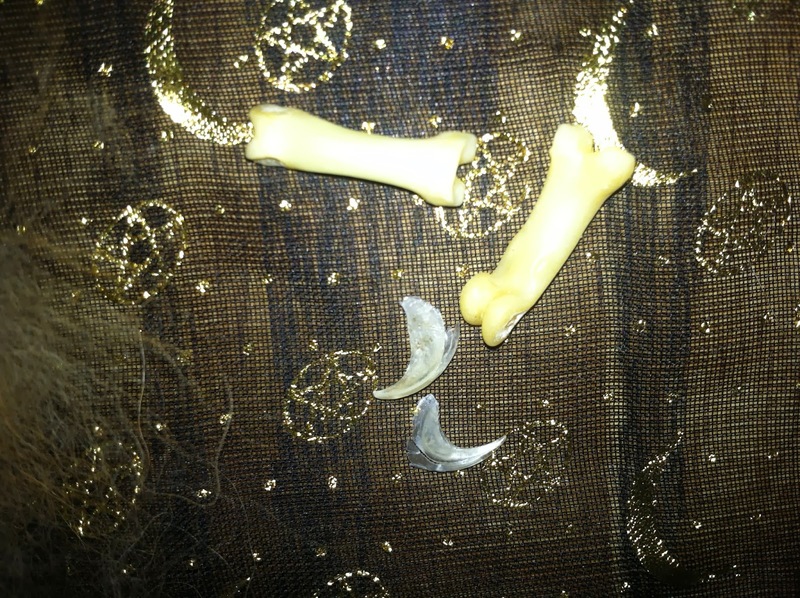 Pins, broken glass, broken mirror, nails, claws. I'm also adding in my cats claws for this, since this is their home too. And don't worry, they haven't been declawed. I have to clip Gaia and Hecate's nails, because they are polydactyl and they have some that they can't retract. If I didn't clip them, they would grow back into their paws, and we don't want that. And I digress, back to the bottle making. Since I did the wolf moon, I still have some wolf hair left, I will be putting some of that in my bottle as well. You will also want to add some devil's shoestring, rosemary, or pine. Or a combo of the three. These are all protective and will drive the evil from your home. Find some glitter to put in your bottle, this attracts the evil to the bottle, then the pins and sharp items will impale it, the liquid will drown it, and the herbs will send it far away. Now for your liquid, you can use salt water, vinegar, red wine or your own urine, or a combo of these. Now, some people will probably go "ewwww", but body fluids are powerful things to include. If it isn't for you then don't use it, go with all vinegar or salt water. You will need a black candle to seal the cork when you are finished filling your bottle. 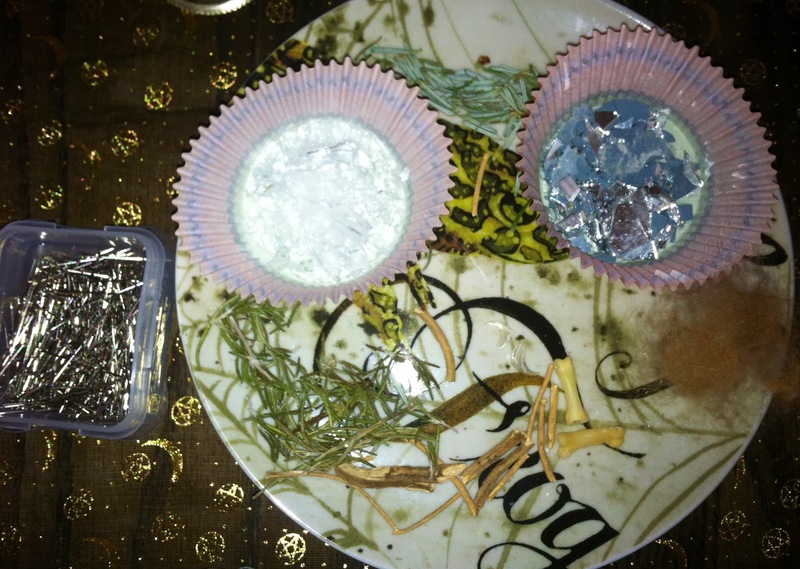 If you plan on hiding it inside, you can also decorate the top with ribbon and charms if you would like. Depending on what type of bone you are using, you may want to look up the totem for that animal, to see how they protect and word it that way. Okay, now go take all of your ingredients (keep them separate) and your bottle to your circle area. Cast your circle in your normal way, ask your god and goddess to bless your work and aid you. Time to make the bottle. You will take each ingredient and empower it for its purpose. Dry ingredients first. State the purpose of each item in turn and place in the jar. Coyote bone: to protect and trick. 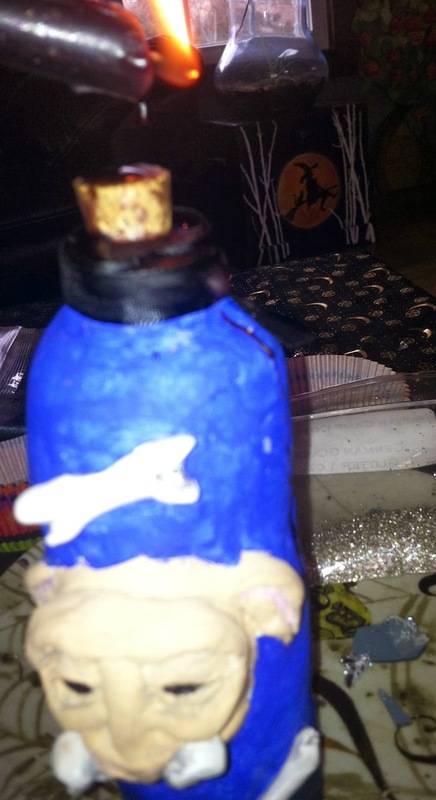 Now, cork the bottle, wax it, decorate it if you wish, and carve a rune in the top of the cork. I caught my cork on fire! Isa would be a good one because it stops any unwanted activity and helps to stop someone that is harassing you. "No enemies will be able to harm me. Pins and needles and nails will impale my enemies, mirrors will cut my enemies, cat, coyote, and wolf (or whatever animal you use) will protect me, and the herbs will fling my enemies far from me. With the power of flame this protection is now activated with no harm to me and my property, my family, or my possessions, or my pets. It is activated immediately"
Close circle and place your bottle wherever you wish, keep it hidden. If you bury it, make sure that it is deep enough to never be found. Your bottle will work as long as you have it and it remains unbroken. Thank you so much for sharing the bone marrow soup idea! I am making mine today :) Love this idea!